WebGL Caps Viewer is made up of two sections: the fist section is a WebGL test that displays a 3D scene with a textured quad and two animated boxes. 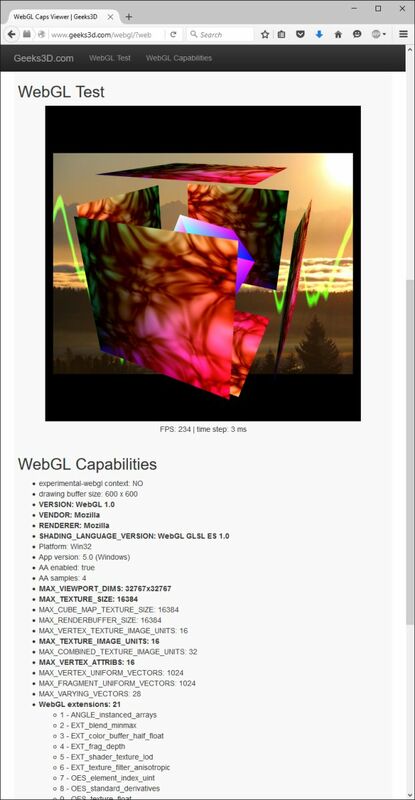 The second section reports all possible WebGL capabilities exposed by the browser and the GPU. One of the boxes of the test is rendered using a kind of liquid shader. This shader requires a decent GPU processing power and is disabled by default on mobile devices. If you want to test the full demo on your mobile device (and maybe freeze a bit the browser), just visit THIS LINK. If you wish to see the WebGL report only, visit THIS LINK. Could somebody with an iPhone 6s could list here all the WebGL extensions that are supported on Safari and/or Chrome?